I was surprised at the use of statistics in secularism. n the following table, the yardstick defined by Dr Hammond has been applied to Muslim population by districts in India. As expected, Dr Peter Hammond’s hypothesis holds true. US 1.0 The lowest population of Muslims in any district is 3.5% in India. By simple observation one can verify the truthfulness of the above statement. From 5% on they exercise an inordinate influence in proportion to their percentage of the population. They will push for the introduction of halal (clean by Islamic standards) food, thereby securing food preparation jobs for Muslims. They will increase pressure on supermarket chains to feature it on their shelves — along with threats for failure to comply. (United States). At this point, they will work to get the ruling government to allow them to rule themselves under Sharia, the Islamic Law. 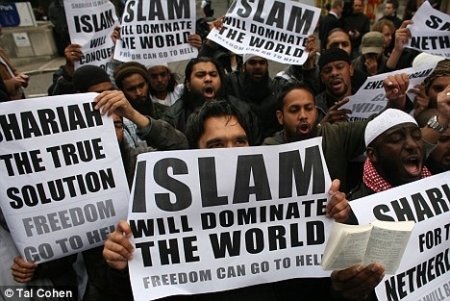 The ultimate goal of Islam is not to convert the world but to establish Sharia law over the entire world. France 8.0 The Uttranchal Government granted 20 acres of land for a madrassa near the Indian Millitary Academy despite strong objections raised from IMA authorities and defence experts. (Land for madrasa near the IMA in controversy, Ravindra Saini, 7 January 2007, Organiser). Dehrdun has 8% Muslim population. When Muslims reach 10% of the population, they will increase lawlessness as a means of complaint about their conditions (Paris, car burnings). Any non-Muslim action that offends Islam will result in uprisings and threats (Amsterdam – Mohammed cartoons). Guyana 10.0 Muslims in Miraj savagely desecrated three Ganesh Idols and attacked Hindus at many places in the Miraj town in Sangli District with a Muslim population of 16%, on 2 -3 September, 2009 and thereafter. The convoluted reason for the unprovoked riot was a painting which depicted the scene relating to the slaying of Afzhal Khan (who desecrated Hindu temples at Tuljapur and Pandharpur) by the valiant Shivaji Maharaj on 30 November 1659 at the battle of Pratapgarh. Bosnia 40.0 On 4 July 2008, four Muslims in the village of Lakshmanpur, located in Murshidabad district with more than 40% Muslim population, beheaded a Hindu man for marrying a Muslim woman. The Shalishi court sentenced the man to beheading for the “crime” of marrying a Muslim woman. The Government of West Bengal had legitimised local Shalishi court. Albania 70.0 The erection of the statue of Tunchathu Ezhuthachan, father of Malayalam language and literature, at his birthplace Tirur, part of Malappuram district with more than 60% Muslim population was not allowed as it is un-Islamic. Finally the issue was settled with the erection of a symbolic representation of an inkpot and brush, the official emblem of Jamaat-e-Islami, instead of his statue. Ezhuthachan used only stylus and palmyra leaf for writing on, he never used a pen or ink. Bangladesh 83.0 In1990 lakhs of Hindus had to flee the Kashmir valley because of being targeted by Islamic militants. Mosques in Kashmir declared jihad and blared warnings from loudspeakers to the Hindus that they were infidels and had to leave Kashmir. To satisfy their blood lust, Muslims then start killing each other for a variety of reasons. The percentages source of Muslim population used by Dr Peter Hammonds is CIA’s The World Fact Book, 2007 and for Indian Muslim Population, the census data of Govt of India of 2001 is used. The census data of 2011 of Govt of India is still not out. Now, Hindus can forecast their future and make their calculated decision on Secularism and Islam based on these statistics, the same statistics that the likes of Owaisi use to egg on their followers.